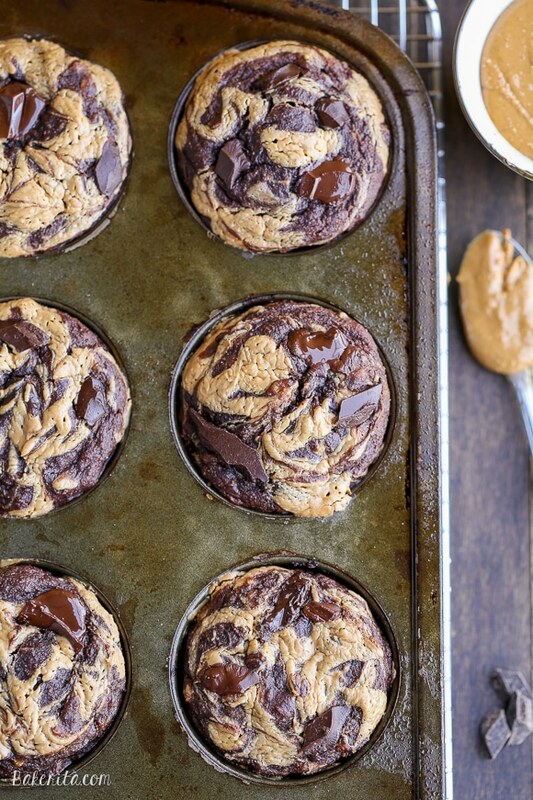 These Chocolate Peanut Butter Banana Muffins are loaded with chocolate chunks and have a peanut butter swirl – you’d never guess that they’re gluten-free and the batter is sweetened entirely with bananas! Chocolate, peanut butter, and bananas. Three of my favorite ingredients, and I use each one of them a whole lot individually…so naturally, I love it when they come together into one fantastically delicious dish, like this oatmeal or these nom-worthy pancakes. 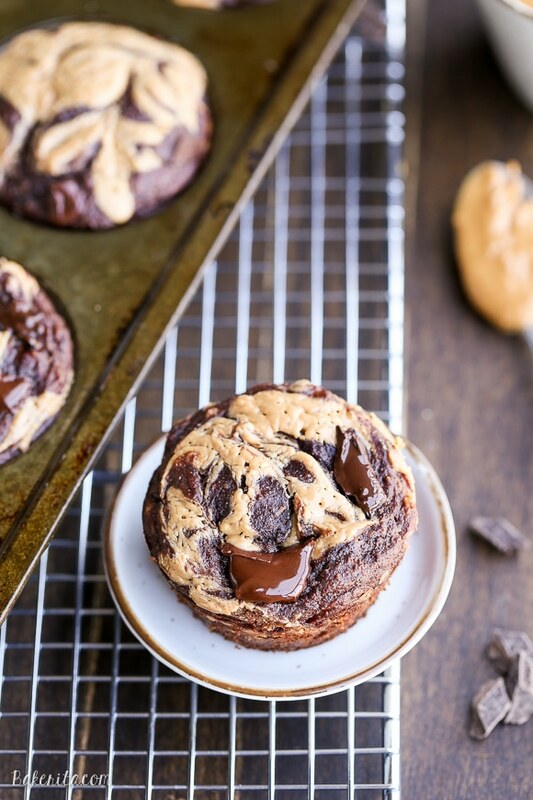 These Chocolate Peanut Butter Banana Muffins are the one of the best combinations of chocolate, peanut butter, and bananas I’ve had in a while – they’re gooey, chocolatey, rich, and amazingly, fully gluten free and refined sugar free! The magic behind the muffins? Bananas! 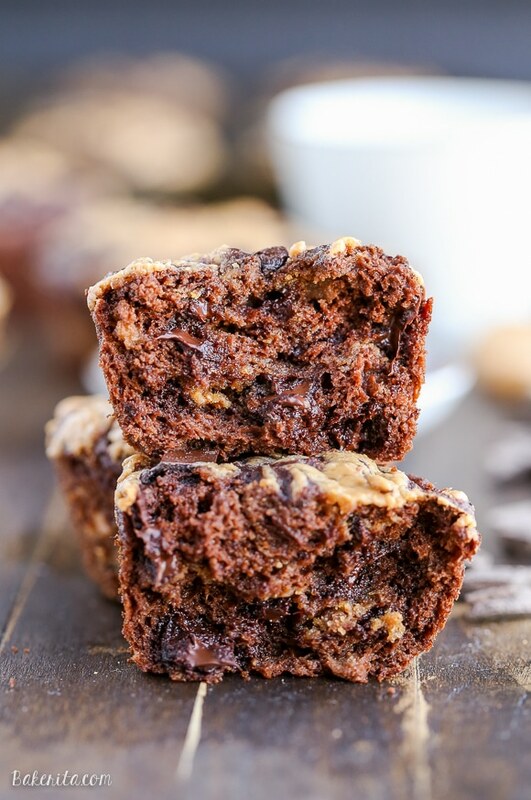 Bananas are the secret magic ingredient behind this Paleo Chocolate Chunk Banana Bread where they act as the sole sweetener, and they play the same role in these muffins. Make sure you use extra ripe bananas so you have that additional sweetness, or you risk the cocoa powder overtaking the banana’s sweetness. Using extra ripe bananas helps ensure you get some banana flavor in your muffins, too! The chocolate chunks, of course, do add a bit of additional sweetener. You can choose to make your own refined sugar free chocolate chunks, or if you’re really wanting to cut down on the sugar, just leave the chocolate chunks out entirely. 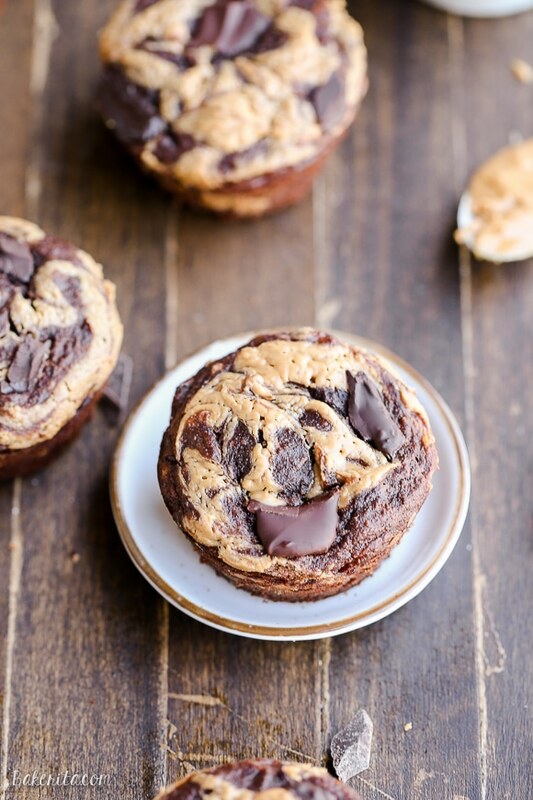 The cocoa powder in the batter will still make the muffins super chocolatey! 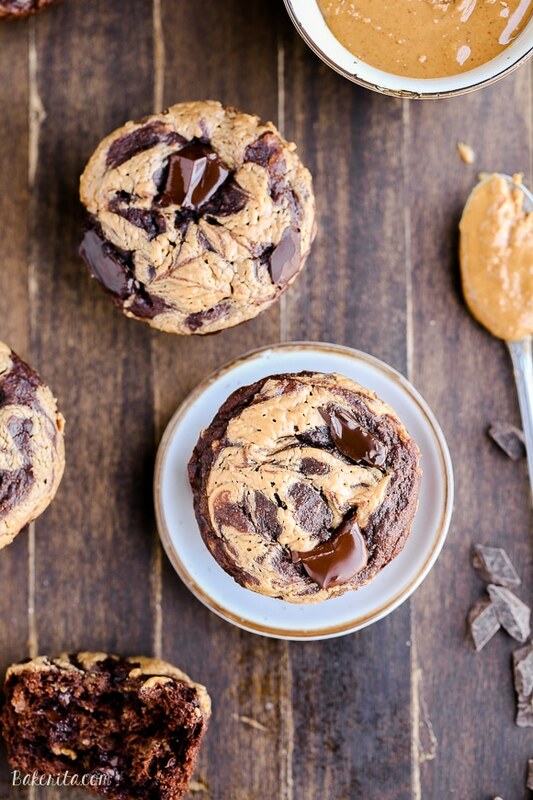 Peanut butter makes an appearance in a couple ways: it’s used for flavor and fat in the muffin batter, and a bit more is swirled right into the muffins before they’re baked, adding a rich peanut butter-y topping and that makes the absolute best muffin tops. If peanut butter isn’t your thing (I don’t understand you, but I know you’re out there…) or an allergy forbids you from enjoying it, feel free to substitute in almond butter, another nut butter, or sunflower seed butter. The muffins will still turn out wonderfully! This recipe is quick and simple and comes together in just a few minutes – it’s the perfect weekend morning surprise for your family, or you can make a batch on Sunday night to keep as breakfast for the week. These will definitely help you wake up with a smile. Make sure to have one while they’re still warm! ;) Enjoy. Remember to #bakerita if you try the recipe! Preheat the oven to 350ºF. Line a 12 pan muffin tin with paper liners or grease with coconut oil. In a large bowl or mixer, combine the mashed bananas, eggs, coconut oil, vanilla extract and peanut butter until fully combined. Add the coconut flour, cocoa powder, baking soda, baking powder, and salt to the wet ingredients and mix well. Fold in the chocolate chunks. Divide the batter between the prepared muffin tins. Add a dollop of peanut butter to the top of the muffin and swirl in with a knife of toothpick. Bake in the preheated oven for about 16-19 minutes. A toothpick inserted into the center of a muffin should come out clean. Remove from oven and allow to cool on a wire rack for about 10 minutes. Flip out onto a cooling rack to finish cooling. Oh my goodness, that SWIRL!! These muffins are seriously packed with all my favorite things and I’m kinda digging that. ;) Obsessed over how good these look, Rachel!! These look soooo good! That swirl is awesome and who doesn’t love a chocolate/pb/banana combo!? yeah these are the straight up best kind of healthy breakfast or snack!!! Love the peanut butter swirl! I wish I had one of these for breakfast! Those sound so good and are beautiful to boot! Have you tried making these with flax/chia eggs for a vegan version? Tried it with chia eggs but it failed terribly. They are a soggy mess!! So sorry you had trouble Bree – I haven’t tried this recipe with any egg substitutes so I can’t guarantee the recipe will turn out when substitutions are made. I’ve never used chia eggs (only flax eggs) so I can’t help troubleshoot without being in the kitchen with you. wow these sound awesome. Thanks so much for this recipe. can’t wait to make these. Hi Lovelyn – unfortunately coconut flour is very uniquely absorbent and no other flour performs similarly. No other flour would substitute equally in this recipe. Sorry! Rachel, So wheat flour would probably not work with this recipe? Or would I just need to change the amount of flour to make it work? I really want to make these but only have wheat flour on hand. Hi Linda, it definitely wouldn’t be the same and if you wanted to use wheat flour, I’d recommend using 2-3x the amount of coconut flour called for, since coconut flour is so absorbent. Unfortunately, I don’t know exactly how much you’d need to make sure the texture was correct. your recipes are very enticing… as i am an insulin resistant persona t this time, the nutritional values would be very helpful in ensuring limits of various elements are not surpassed. is there an easy and fat way of obtaining the nutritional values per recipe? Hi Stevieo! The nutritional info for each recipe can be calculated here: http://www.myfitnesspal.com/recipe/calculator. I don’t provide the info because different brands have different nutritional values and changes each person makes to the recipe can affect the outcome. Hope this helps! Can you tell me the nutritional info per muffin please! I made these. They turned out great. One tip, heat your peanut butter up a bit to achieve the swirl otherwise it just stays a clump. Hi Danielle – thanks for the feedback! I’ve updated the recipe card with the nutritional info. I’ve fallen in love with these muffins. It’s a combination made in heaven…chocolate and peanut butter!! Almost no one else in my family can tolerate the chocolate level of these muffins but I can and LOVE IT!! They are so tasty and INCREDIBLY filling. I’ve made them 3 or 4 times at this point, they’re just soooooo good! WOW this muffin combination is everything! Came out perfect and love that they only use one four and only sweetner is bananas! So glad you’re loving the muffins, Elizabeth! Thanks so much for your feedback. I made these last week and LOVED them! Posted a review on my gluten-free blog to share the wonderful recipe with other chocolate and peanut butter lovers. :) Thanks! I was debating on using cacao powder instead since some of your other recipes call for that. Would it not work well if I used cocao powder instead? Either is fine – they’re different versions of the same product (cacao is raw, cocoa is roasted). Welcome to Bakerita! I’m Rachel, a baker and recipe developer with a passion for nut butters & creating easy, mouth-watering desserts and baked goods! I hope you find a recipe you love. Never miss a recipe! Subscribe to have each and every new recipe delivered straight to your inbox. This site contains affiliate links, which means I receive a small commission if you purchase a product. It does not affect your price at all, of course. Thank you for supporting Bakerita!